Staff photo by Allison Potter. Dylan Foster practices maneuvers on a ramp during Skate Day in the Robert’s Grocery parking lot on Friday, May 30. More than 50 local skateboarders observing the third annual Wrightsville Beach Skate Day converged on the Roberts Grocery parking lot Friday, May 30 to celebrate. 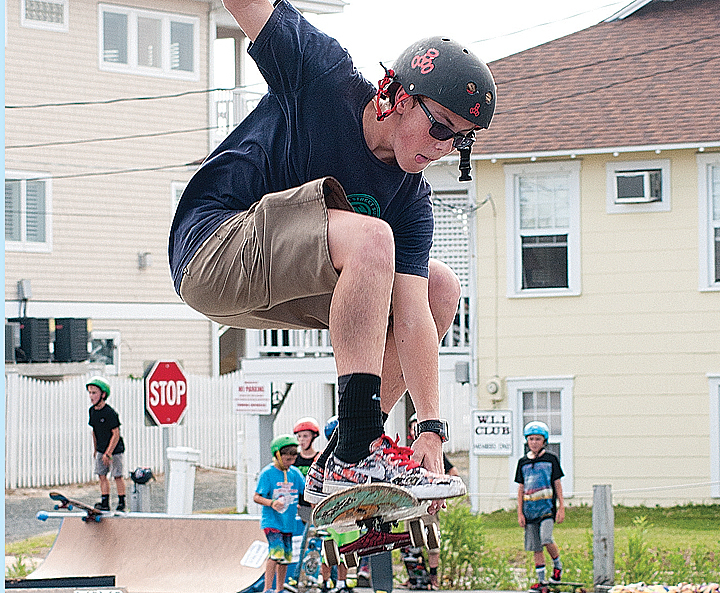 The Wrightsville Beach Foundation, a private nonprofit organization, coordinated the event to promote skateboarding in the community with the hope of one day generating enough interest and support to open a town skate park. Wrightsville skaters who congregate in unorganized venues to participate in their sport agreed that a skate park would benefit the community. Many of the skaters involved with skate day were middle-school-aged kids who were thrilled at the opportunity to skate in an organized event in their hometown. “My favorite part is just skating around with my friends and being able to challenge myself on all these obstacles out here,” said seventh-grader Hayden White. The event featured a makeshift skate park using equipment donated by either local skate shops or skateboarders. Overall, skate day included 12 ramps, four rails and three ledges for the skaters to use. Aside from raising awareness about the sport, a huge focus of this event was to practice and demonstrate good safety tips for the younger skateboarders. Dr. Noah Pierson, local family medical practitioner and skater, attended the event to participate and also give a short speech to the kids and parents about the importance of wearing a helmet, which was the only rule enforced during the event. The event concluded with an assortment of raffle prizes including two new skateboards.